For the first few weeks after my children were born I struggled with the fact that (a) I was ravenous ALL THE TIME (probably because I was breastfeeding) and (b) I only ever had one hand to eat with, because the other was constantly taken up with holding our new little bundle of joy. So when friends of mine had their babies, I wanted to make them some food that was delicious, nutritious, and could be eaten with one hand without spilling too much on their baby’s head. It was then that I came across this amazing recipe on Smitten Kitchen. I made a few tweaks (reduced the salt content, switched the white sugar to brown, added flax seed, and removed the corn syrup) and ended up with the most delicious granola bars. They are pretty calorific due to the nuts, butter, and almond butter, but they are extremely nutrient dense, making them perfect for postpartum moms, post-workout snacks, and, well, anyone in moderation. So here is my version of the recipe adapted from Smitten Kitchen. 2. Combine the oats, blended oats, salt, cinnamon, nuts, and dried fruit in a large bowl. 3. Combine the butter, syrup, and water in another bowl. 4. Pour the wet ingredients into the dry ingredients, add the almond butter, and stir to combine. 5. Line an 8″ x 8″ baking pan with parchment paper, pour in the mixture, and press it down. 6. Place another piece of parchment paper over the top, and use a book or another baking pan to press down on the mixture. 7. Remove the top piece of parchment paper (but save it), and place the granola bar mixture in the oven for 30 to 40 minutes, or until the edges are brown. 8. Remove from the oven, place the spare piece of parchment paper on top of the granola bars, and press down again with a book or baking pan. 9. Allow the granola bars to cool completely in the pan before cutting (this is crucial otherwise they will crumble and fall apart). 10. Once the bars are completely cool, remove them from the pan and cut into squares. 2. Wrap each bar with a small amount of plastic wrap. 3. Place them in a ziploc bag flat in the freezer. granola is such a good ingredient! Healthy, cheap and delicious! could’t be any better! These bars look fantastic, from the excellent ingredients to the toothsome texture. Looks like it would be right up my alley! Thank you for your comments. I’m in the process of freezing some of these bars to see how they hold up. I’ll update once I’ve defrosted and tried them. 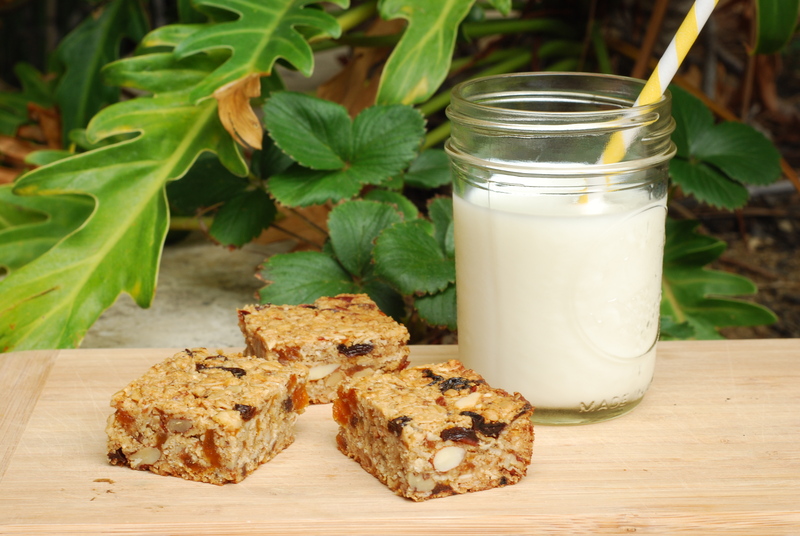 I can vouch for the deliciousness of these granola bars! Thank you so much. And thanks for the great link party. These bars look so good – your friends must have appreciated them! Just full of delicious, healthy things to give them much-needed energy!